It is thought that there have been four bells rung in Campsea Ashe Church from the mid sixteenth century. Little is known about the bells in the early days, but the inscriptions on the bells indicate they were cast in 1601, 1615, 1714 and 1729. Very sadly, the 1729 bell, cast by Thomas Gardiner of sudbury, was stolen in 2010, along with eight other bells, from the Bell Hangers works whilst it was being restored. However, for most of the twentieth century the four bells were silent and neglected. We know that they were rung by a band from Blaxhall in 1907, again in the 1970s and possibly on a few other occasions. The tenor bell was chimed, however, for many years. The Churchwarden had responsibility for this and he did his duty most Sundays. 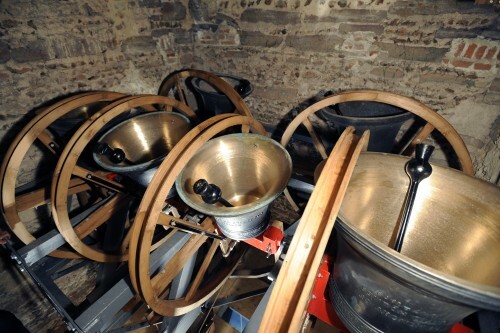 With the Millennium in mind, and with the help of private donations and some grants, a group of local ringers decided to undertake some essential restoration, just to enable the bells to be rung again. This was successful, although the bells had a reputation for being somewhat “out of tune.” The local band, mostly beginners at that time, held a weekly practice and rang for Services and Weddings. Some ten years later the Church decided to undertake a full restoration of the bells and to augment them to make a peal of six bells. The oldest bell in the tower was cast in 1601, so there is a long history attached to the bells. For many years there were just four bells cast by three different founders and so it is likely that the bells were not cast for Campsea Ashe, but they were brought here from different towers. Download our leaflet about the bells here (over 5mb). 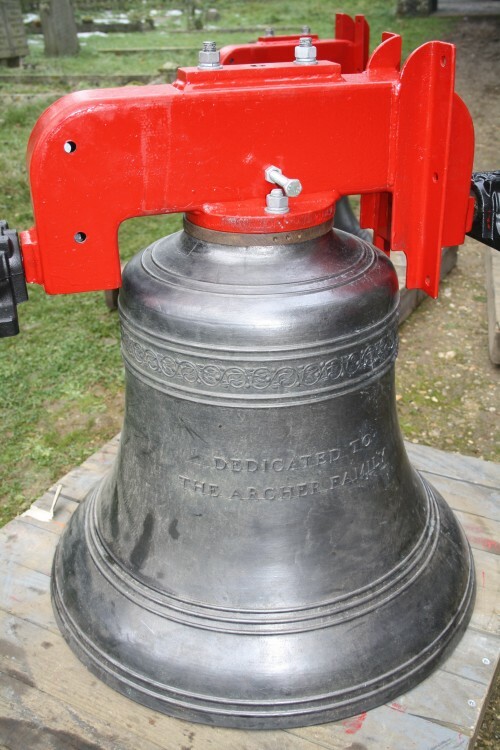 The front three bells, along with the tenor bell, are the newest bells in the tower and were cast in 2010 by Whitechapel Bell Foundry, London. They were cast as part of a major restoration and augmentation project and were hung by Nicholson’s Engineering. 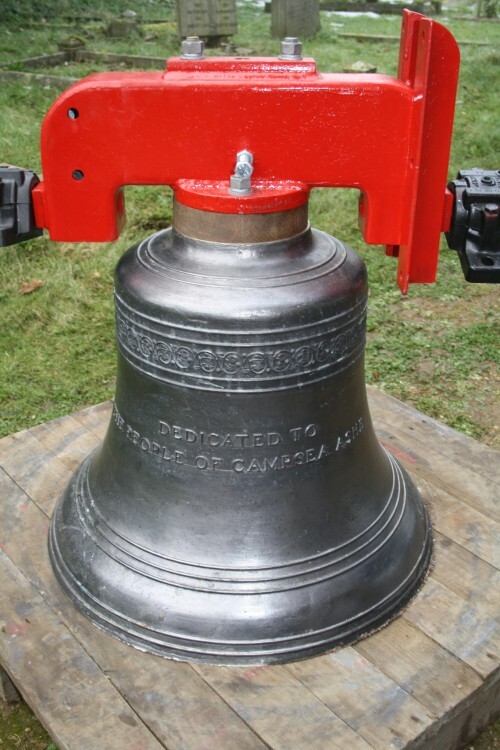 The treble is known as the Village Bell and is dedicated to the people of Campsea Ashe, past, present and future. The people of the village raised £7000 to pay for this bell. The second is the Old Rectory bell and was sponsored by a visitor to the Old Rectory who became a keen supporter of the bells project and to whom we are very grateful. The third is dedicated to the Archer family, a Suffolk family for many generations and is sponsored by a member of the family. The fourth was cast in 1615 by John Brand II. He was a Norwich bell founder coming from a well known family of founders. He worked closely with his father, William, and they worked mainly in East Anglia. There are around 90 bells in Suffolk produced by his father, although fewer by John himself. It is not known when John was born, but he was certainly casting bells in the early part of the century right through to at least the 1650s. Locally some of the bells at Framlingham and Blaxhall were also cast by him. He is buried at All Saints Church, Westlegate, Norwich and his foundry was close by. The fourth bell is dedicated to all ringers and was partly paid for by donations from visitors to the old ringing chamber. This bell, along with the tenor that was stolen was cast by Thomas Gardiner of Sudbury. He was casting bells from 1709 - 1762, so our fifth bell was one of his earlier efforts. There are 82 of his bells in Suffolk, many more in Essex and he cast 259 bells in total. Originally Thomas worked for another bellfounder, Henry Pleasant, but after Henry’s death he set up his own foundry in Sudbury on land between Burkitts Lane and Weavers Lane. He also had a foundry in Norwich. He was casting bells for over 50 years until his death in 1769. The fifth bell dedicated to Reg and Betty Oxborrow, long time supporters of the Church. They lived in The Smithy opposite the Church. This bell was cast in 2010 at Whitechapel. 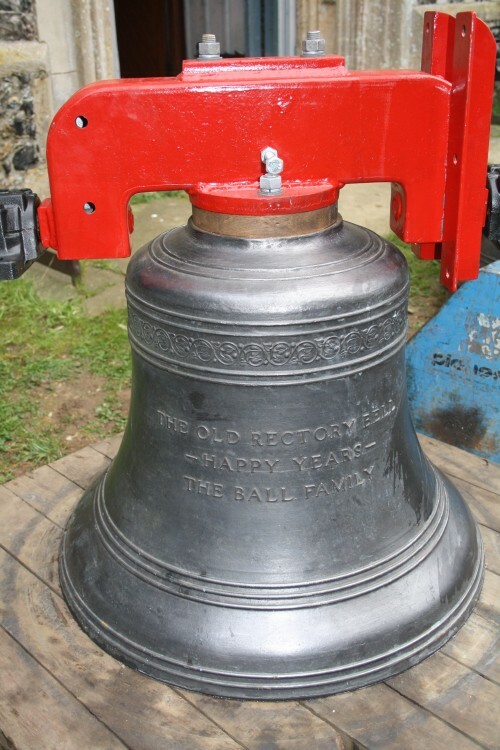 The original intention was to use the old third bell as our tenor, but this bell, along with the three new bells, was stolen in an audacious raid on the bell hangers premises in 2010. 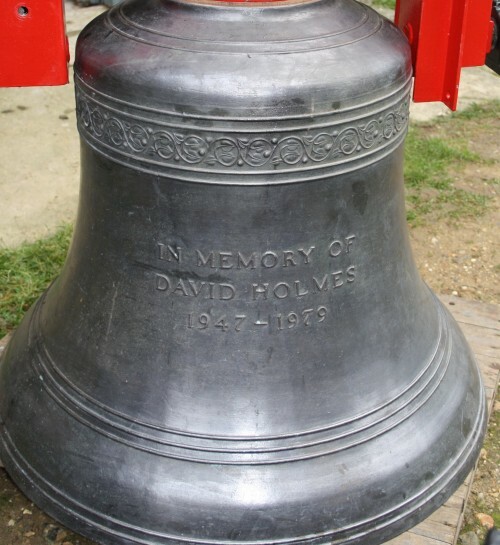 The tenor is dedicated to the late David Holmes, brother of a ringer at the tower and sponsored by his family. The Service Bell is the oldest of the bells at Campsea Ashe and was cast by Richard Bowler in 1601 who was founding in Colchester from 1557 to 1604. In 1598 Richard was in trouble with the law due to his cattle straying onto the land of Reginald Oldfield, but it is not known what the outcome of the case was. Then in 1600 he was seriously assaulted and injured by Ambrose Gilbert and was close to death. During his recovery period his bells were cast by Richard Holdfield. Usually Holdfield put Bowler’s name on the bell, but with his own initials, but that is not the case with our tenor which simply has Richard Bowler’s name on it. It looks likely that the bell was actually cast by Holdfeld in Richard Bowler’s foundry. The Service bell remains in the old frame and can be chimed from the new ringing gallery.